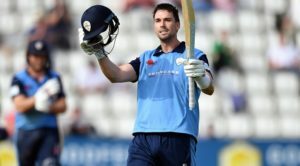 James Taylor took 3-26 on day three as Derbyshire won by 336 runs against Leeds/Bradford MCCU at The Pattonair County Ground. Ravi Rampaul claimed figures of 3-7 and Sam Conners also took 2-13 on debut as Derbyshire bowled out the visitors for 94. Earlier in the day, Luis Reece (96) and Hughes (48) combined for a 117-run partnership before Derbyshire declared on 232-5. Reece the got the day off to a strong start for the hosts as he passed his half-century in the opening over of the day, with two fours in three balls. Alongside Hughes, Reece continued to accelerate the run rate to take the score past 150. The pair continued their fine form to bring up the century partnership shortly after, before both batsmen fell short of their respective milestones. The partnership was worth 117 runs as Hughes was out for 48, before Reece was trapped lbw three balls later after a fine knock of 96. Wickets began to fall at regular intervals as Derbyshire looked to score quickly before the lunch interval. Josh Haynes got his third to remove Matt Critchley for 12 before Tom Lace also fell without scoring to Angus Dahl as the hosts slipped to 215-5. Anuj Dal (16*) and James Taylor (11*) extended Derbyshire’s lead to 430 runs at lunch, before the hosts declared on 232-5. Ravi Rampaul got Derbyshire off to the perfect start after the interval as he took two wickets in the first over of the session. Haynes fell victim to Rampaul for the second time as he was lbw with the frist ball after lunch, while Oliver Batchelor edged to Wayne Madsen at first slip without scoring. The West Indian international then claimed his third in quick succession as he dismissed Taylor Cornall for 5. Taylor was supporting Rampaul well, and his consistent bowling paid dividends shortly after, as he removed Dahl (10) to reduce the score to 19-4. Sam Conners then came into the attack to take two wickets in as many balls as the visitors continued to collapse to 33-6. Ashraf was the first of his scalps as he edged to Hughes in the slips before Conners bowled Read with a big in-swinging delivery. Anuj Dal then took his maiden wicket for Derbyshire to remove Andrew Neal (4), before Darren Ironside and Josh Fallows came together to frustrate the hosts’ bowling attack. Ironside (24) and Fallows (19) combined for a 45-run partnership before Taylor removed both in quick succession to take his wicket tally to three. 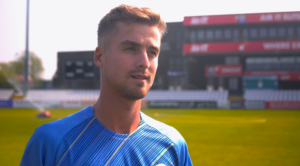 Critchley then took the final wicket of Josh Holling (3) as Derbyshire recorded their third-highest ever victory in the club’s history. Vitality Blast is back! 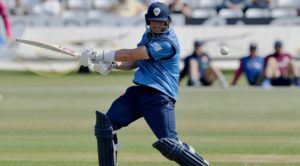 Derbyshire Falcons host seven Twenty20 games this summer. Purchase your tickets in advance and save. Buy online or call 01332 388 101.